Nintendo president Satoru Iwata assured everyone looking forward to the Wii U launch that it won't be a repeat of the 3DS's high-priced launch debacle. We won't make the same mistake that we did with the 3DS, which was considered relatively high by consumers. Of course this is no surprise — Iwata's hardly likely to say the opposite — and back in December 2011, Nintendo of America Reggie Fils-Aime said Nintendo doesn't want a 3DS price situation on Wii U. Until Nintendo announces the Wii U launch price in a few months' time we'll just have to sit tight. 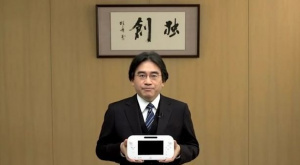 Iwata also moved to assure investors Nintendo would return to profitability by the end of the financial year. I trust you to give a price that people will consider fair. Good, because I'm getting it day one no matter how much it costs. Now reveal the price so I can finish paying it off. I'm getting at launch regardless of price I don't think it will be particularly cheap tho. I don't think it will be more then $350. At least anything above that I won't consider a fair price. Obviously in America it'll be fair,but in Europe,we'll get ripped off buy the retailers. i wouldn't pay more than 200 e.
300$ bundled with NintendoLand!.. Please? I really hope not Iwata, I really hope not. You've cut a lot of industry standard features from this machine (no truly next-gen graphics, no set of analogue triggers on any of the controllers, no basic CD/DVD playback, no internal hard drive...), all supposedly with the best intentions of keeping the cost down (for us as well as you I assume), so if you release this thing and it costs over £200** in the UK (which even at £200 will still be your most expensive home console ever if I recall correctly) then imo it's all total bull or at least it's a total failure to live up to your oh so mighty words. You know where I stand, Iwata. Also, if you do get it wrong and release this thing for over £200 in the UK (or without a decent value proposition based on what's in the box), please don't you dare have the utter cheek and arrogance to come back and say that we, the long time loyal Nintendo consumers, are simply insatiable! ** Or, if you're going to charge around £200 or slightly above then you'd better be putting some truly brilliant stuff in that box with the basic Wii U console and controller to actually make it a genuinely satisfying value proposition (as I have previously suggested; bundling both NSMBU and NintendoLand, even if they are digital downloads, for example). I wouldn't say anything over €300 wouldn't be a fair price. €300 would be fair but if you release it at €250 (wishful thinking) then you will have the same trouble with the wii with trying to keep it in stock. I'm guessing people want Wii U to be better but somehow cheaper than previous consoles. I'll give u a hint nintendo, if the system is $300 or less, people will probably rush to get it, if it's OVER $300, u'll more than likely see the exact same happen with the Wii U as did the 3DS. Based on all the corners Nintendo has clearly cut with this machine, relative to the generation and the technology of the time etc (no truly next-gen graphics, no set of analogue triggers on any of the controllers, no basic CD/DVD playback, no internal hard drive...), I don't believe it should be any more expensive than roughly what the Wii was at launch. If it is then Iwata is just feeding people what they want to hear but not actually delivering, imo. Going above £200, unless they put some truly amazing stuff in that box (such as a couple of free games, even if digital, etc), is just pooing on our heads from a great height and counting on fanboys to lap it up, imo. Apart from having one of the most advanced game controllers ever seen, of course. I'm sure there's a few other little cost saving trims here and there that I've missed also. I see your point, and personally I expect it to drop just below the £200 mark. Time will tell! Yeah it's gonna be priced right for sure, as proven by their pricing of 3DS XL. That's what I'd dream of; somewhere between £150-£200 but more realistically nearer the £200. Nintendo has a potentially great little console, despite some of it's shortcomings, but if they are actually standing up and repeatedly stating for the record "We won't make the same mistake that we did with the 3DS, which was considered relatively high by consumers." then they actually have to deliver on this. Or else it's the whole "You will say WOW when you see Wii's graphics" or "Wait until next E3" stuff all over again. I love Nintendo too, and I really do want the Wii U to be the next coming of the Messiah, but I'm not going to let myself be tricked again. Nintendo has to deliver on the handful of things they've got left that they haven't already fallen slightly short on as I see it. The price is now, after Iwata repeatedly stating it's importance, one of these things Nintendo now absolutely has to deliver on. Else, I for one, walk away. @16 was that sarcasm? I think we can expect something around 200/250 € here in Europe... If it will be like this, I'm buying it Day1! "No truly next gen graphics?" Um, who cares? I have this suspicion the Wii U may have ended up being more powerful had the 3DS performed as expected at the original launch price. US $250 is sounding quite likely! It is going to be interesting to see exactly how much Nintendo prices the Wii U at. I know that they don't want to repeat the same mistake that they made with the 3DS launch price. I read that Iwata was concerned about the cost of Wii U Gamepad's second screen and he actually considered scrapping the idea at one point. I imagine it is going to be a tough balance for Nintendo to find a price that consumers find appealing as well as makes them a profit. It is not just us that are waiting to find out the price, I'm sure that Nintendo's competitors are eager to see what the price will be so they determine their next move. I hope the company make a profit. I'm betting on 299.95 €, hoping for 249.95 €. Why won't they just announce the facts? This is such a non-news. @BestBuck123 Worth only 100 € for you?? Man, I think even the SNES is still ''worth'' several hundred. Day one for me all the way. Though a price that will be easier on the wallet would be appreciated as well. I'm sure they learned there lesson from the 3DS release. Why do people say the Wii U won't have ground-breaking graphics? Was that actually announced? No, just HD graphics and that makes it next-gen for Nintendo. Just because the PS3 and XBox360 have HD graphics and looking at it, where can they honestly improve on? Unless we're playing actual film-quality games it's going to be extremely difficult for computer games to increase their quality of graphics. From what I've seen Nintendo are meeting the consumer's demands by bringing their new console to HD-standard graphics but still bringing something new to the table as they almost always do. If we're going to have a nice bundle, 1 or 2 games, maybe an additional wiimote and nunchuck (not that I'd need them) then I can see myself very willingly paying upto £300 for it - as long as I can also get hold of Pikmin 3 and transfer my VC downloads across! @odd69 American Dollars, British Pounds, Euros or what? I'm hoping it will be around £200 - £225. The most I'd be willing to pay is £250 and for that I'm hoping it comes bundled with New Super Mario Bros U, or at the very least it had better come with Nintendo Land. @BestBuck123 If it's only a games console, then take your own advise, relax, and don't sweat things like the graphics. @Treverend OH MY GOD THANK YOU. Finally, someone else who feels this way! Few tech devices are reasonably priced in the UK though. Only the standard 3DS is now after an emergency price drop by its makers. The 3DS XL minus a charger is too expensive taking into account the standard 3DS' price now...He must be talking about NA and Japan? a machine that can barely provide more power than the ps3 ? i wouldnt pay more than 199.99$ w/o taxes.i fear the tablet* gamepad* will boost the freaking price. I'm sorry, I know some people talk up the Wii U cost based on the Gamepad, but there is nothing to it compared to a tablet - no CPU, no onboard memory, no cellphone or WiFi - it's a $40 controller like any other controller but it has a screen, and it's a cheap screen at that. And since Nintendo CAN'T sell a home console W/O a controller of some type, the only cost associated w/ the Gamepad is the extra cost for the screen, which I don't think is much. i honestly don`t get why some people want cd/dvd playback on a nintendo console. how many people would want to listen to cd`s through their tv`s anyway, music doesn`t sound anywhere as good through a tv as it does on a stereo. besides, if your planning on getting a console, any bets you`ll have a dvd player by the tv and a stereo somewhere in the room anyway, so it`s just not worth the extra cost to add them in. as for hard drives, the wii u will support them externaly, so it`s not that much of problem, especialy as we can dictate the size of our own hard drives that we buy. and there won`t be any limitations on them because there`s no need to have them made by nintendo to slot in the wii u, or have some propriety software to run them. unless nintendo put gamecube games onto the wii u vc, then it`s not going to be huge issue to have hard drives anyway, i have a 16 gig sd card with over 120 downloads for my wii, and i`m still no way near to filling it up. the only way for hard drives to be an advantage is if your gonna buy all of your games via download, including retail games. until then, it`s not a huge issue. I don't care whether or not Wii U fits under this nebulous term of "next gen" or not. Video game consoles don't need to do everything; as long as they can play a great selection of fun games at an affordable price, then that's what counts. If the Wii U misses out on ultra futuristic, cutting edge technology, I won't be hurt, because I still play GameCube and Wii games today, and I don't see anything wrong with them. I won't buy a video game console for excess technology. I find it ironic that things like graphics would strongly influence a person's decision on a console; those things seem more like bonuses than organic parts of the game experience. Nintendo live in there own little bubble....."don't want to make the same mistake as we did with the 3ds" mmmm 3ds XL £180 no charger....... yep you have learned......NOT! most gamers are complaining at paying $500 for systems, at least on a lot of the other forums i frequent. with today's economy making discretionary spending a big deal for many, if not most of us, pricing is a big deal. if you don't have any monetary cares, then it's great for you. but nintendo does need to learn from the 3DS pricing fiasco and price the WiiU accordingly. if you are not getting a blu-ray player etc like the others offer, then that has to be taken into consideration. i am not saying ninty should put one in the WiiU, but even a lot of casuals know that the PS3 offers it. perhaps it is not so much bias against nintendo as just a reality check. 350 is what I'm betting on. Maybe even lower considering it Nintendo always has "cheaper" console prices. I, again, apologize for my blunt comments. Dang. Sorry for the triple post AND spelling mistake. Dang phone. yet you are 'so happy' that you sold your 3DS last year?? Based on Nintendo's comments recently, I think it's very likely the Wii U will debut at 250 US dollars, definitely not above 300. I think there will be only one bundle option but there will be white and black versions and it'll also not come with the Pro Controller or a Wiimote. It'll also be interesting to see what an extra Wii U GamePad will cost. I'm thinking anywhere between $50 to $80. Probably wait 3-4 years for gradual price drops. That controller will have to have at least a low level CPU in it for it to process a video stream from the console and to also be able to play small games and be able to act as a TV remote while the console is off. And in comparison to other controllers, if the Wii U GamePad was somehow $40-$50, then that means the PS3 controller really should not cost anymore than $25-30 new. The Wii U has an accelerometer, gyroscope, geomagnetic sensor, rumble, stereo speakers with volume slider and headphone jack, camera with IR sensor bar, IR transponder, that 6.2 inch screen, NFC, most likely a little internal memory just like the Wiimote, some form of CPU because of the things it can do without the console, along with all the buttons and sticks/pads needed on a controller. Now since a PS3 and X360 controllers still cost you $55 nowadays, the Wii U GamePad would be more like an $80-90 controller. Some of those features on the controller would probably be cheap to add, but since current controllers are so goddamn expensive, value-wise in comparison to PS360 controllers the GamePad will still be worth a whole lot more. Personally I still have no idea why people are already judging the power without much hard evidence and are already devaluing the system before launch. Though honestly, I'd probably only get it at launch if it's around $300. $350 would be pushing it. Editing this comment because it refuses to delete. I'm expecting/hoping that the Wii U will launch at $250-300, bundled with Nintendo Land. I don't think that's too farfetched, seeing as how it has no hard drive, and the PS3, including a 250GB HDD, sells at $250 for a profit, and probably a pretty big one (correct me if I'm wrong). The Wii U will be stronger, of course, but with no hard drive and no profit per console sold (breaking even instead) I still don't think it would be a ridiculous price range. How about 250€ with Nintendo Land bundled? I will be amazed if it will be $299 but i'm anxious now to hear an answer from them. I would be surprised if it was $250 at launch, maybe in a few years, but $300-$350 is more realistic for launch. Don't forget that Nintendo will want to price it somewhat relative to the current market, which includes Xbox 360 and PS3 units (as well as the Wii itself). While Wii U will be the next generation, it will have to compete in the same market as the previous generation (until such a time that Microsoft and Sony release their follow up consoles). I think $300USD is the maximum they would push for, but I think $250USD is much more likely. @Kirk You don't recall correctly. The N64 was 250GBP at launch. I think $300 is what it'll be. Nintendo can't go any higher than that. I hope its around there, since I've been saving up all year so far. As long as it's under $400 bucks, I'm buying it at launch day! $300-350 is about right, no more. I'm a little more forgiving because I can still use (apparently) my balance board, 4xWiiRemote, 3xNunchucks, 2xClassic Controllers, 2xClassic Controller Pro....oh, and all of my rechargeable batteries. So that is a couple of hundred dollars US that I won't have to spend just to play with friends. Still, US$300 is about all I would be willing to pay, and even then I might hold off for a little while. This is the golden time to buy all of those good Wii titles that have slipped by over the years, although since I own about 120 WiiWare/VC games and 64 full release titles, there aren't THAT many I've missed. To be fair, Iwata-san also said they wouldn't make the launch title mistake the 3DS had...And it looks like they're going to make the same mistake. I will pay up to $900 US. No more. @warnerdan I'm sorry, but your comment comes off like Nintendo is the only company who innovates and/or does anything substantial outside of FPS games. That's a bit far stretched mate. The current gaming market — with and outside Nintendo's consoles --is literally exploding with creative indie/third party titles. @Treverend The reason people won't pay high(er) prices for Nintendo's systems is because they don't put high end technology in their consoles. Sony and Microsoft have pushed the industry forward quite drastically with highly advanced tech with each of their consoles' launches. Nintendo innovates with old tech. It's what they do best and consumers don't want to pay high prices for current gen technology. It's really that simple. It's not some sort of 'fanboy' mentality or bias. The constant withholding of Wii U's price means it'll either be priced above the $300 mark, or that they'll match the 3DS launch price and current Vita price: $249. That's my two cents. $350 bundled with Nintendo Land at the very most. If not , then $300 . I'm hoping for $299. Any higher than that may put off people who are on the fence about buying one. I think that would be a fair price and hopefully it will come bundled with Nintendo Land. Nintendo also has to compete with sales of the current Xbox 360, PS3, PS Vita as well as Apple devices. If they set the Wii U price at $299 or lower(doubt it but that would be great) then that should give Nintendo a good advantage against Microsoft and Sony's next generation of consoles as long as they can deliver a steady stream of first and third party games. It this costs $299.99 and comes with New Super Mario Bros. Wii U, then I'm in. Definitely getting one, no matter what. And it does have a hard drive. I remember reading somewhere that it had one and that it was extendable by external storage. If you are real nintendo fan, you will buy it no matter what price .. and be there on the first day ! @-KwB- I agree, and welcome to NintendoLife! Lets see last-gen graphics+the portable gamepad. 250 euro is a fair price. Anything above that=failure. I'll buy it when it's less than 180 euros, the new Super Smash Bros has been released and it has about 3-4 exclusive JRPGs and/or Japanese Strategy RPGs. I learned my lesson with Wii and 3ds, I won't be a moron and buy systems at launch any longer. Then I stand corrected regarding the highest launch price of a Nintendo home console. Still, the N64 at the time was by far the most cutting edge console on the market, using world leading Silicon Graphics technology, with a brand new innovative controller to boot, that introduced us to analogue sticks, rumble packs and memory packs, a unique three pronged design, along with the console itself having built-in 4-player controller ports. So, I can at least understand why the N64 justified the higher £250 launch price at that time**. The Wii U on the other hand only has the new-fangled controller, just like N64 had too, but lacks any cutting edge 'top of it's class' tech in any other areas that I can see. I just can't see any good reason the Wii U should be over £200, if Nintendo plans on sticking to it's word, and even if that means Nintendo itself has to make some sacrifices and compromises to ensure we get it at a reasonable price. I would possibly be ok with them going to say £250 if they bundled in a couple of great games, like NSMBU and NintendoLand for free, even if they were digital versions where we'd have to subscribe to Nintendo's online service to get access to them, and possibly included a couple of other incentives in the box (dunno what). Nintendo just needs to make the Wii U a truly attractive value proposition and imo anything over £200 is making that a very difficult proposition unless they really do include some pretty amazing additional incentives in that box on day one, beyond just the console and a new-fangled controller. ** Remember however that the N64 did go on to become the first Nintendo home console that didn't lead the worldwide market in terms of sales by the end of it's generation, and it could be argued that was partly because a lot of people simply found the Playstation a far more attractive value proposition overall (one reason was maybe because it had a CD player built in for example, the hot new thing at that time, which also led to far more third party developers jumping on board to develop games for it), even at a slightly higher price. Don't gimp the machine before it's even launched in an attempt to save a few bucks initially and then end up with a product a lot of people will never be fully satisfied with, regardless of the price. That to me certainly doesn't fulfill my own personal business mantra: "Satisfy the customer, at a profit." As an example; the iPhone 4S is around £500-£600 if you buy it outright, which is way too expensive for most people, but through various phone service subscriptions/contracts you can actually get it for free (with the right monthly subscription) and then pay it up over a couple of years while still getting full access to all it's features and services etc. There's also quite a few different payment/service options depending on each person's preferences. Now, some people might bulk that idea but I'd rather get the most perfect console Nintendo can make (in every way), even if it's an expensive machine in and of itself (maybe that's unavoidable if they want to get the actual machine right, for everyone), and then have a few different options of how each person personally chooses to buy and own that machine. Some people could choose to buy it outright (if they have the cash), some could pay a small amount upfront and then a monthly cost over six months or a year, others could get the console entirely free and then pay it up over a couple of years. There's probably also a few other options they could offer here too. It looks like Microsoft is going to try something very similar to that with the Xbox 360 soon and probably will do something similar with the Xbox 720 too. Also, current Xbox Live users pay a monthly/yearly fee already so I don't see why Nintendo couldn't include that as part of their payment/subscription, possibly allowing gamers free access to a load of games as part of that service too (like OnLive does) to make it a genuinely attractive and compelling value proposition. I personally think that's a better all-round solution than simply gimping a machine to the point I know I'm always going to find issues with it in one way or another and then potentially still asking me to pay a little more for it outright than I would want to anyway. I don't see why Nintendo can't get with the times (in multiple ways). @Kirk For me the subscription type approach just cannot work - I think if people were paying, say 30GBP per month for a console they would just not buy any games for it, or at least expect games to be about 1 or 2 quid - you can say goodbye to games like Zelda. I think the XBox subscription deal that they will be doing soon will prove that this pricing model won't work. If people don't want, or can't afford to buy a console outright then there are many existing places like Bright House, Catalogues etc that can fulfil the same purpose. As for CD/DVD playback and other things like that - they are getting to the point that they are legacy formats - even Blu-Ray hasn't restarted the sales demand for physical media, so I think that as long as Nintendo provide a robust streaming service through 3rd parties like Netflix and Lovefilm then the multimedia aspects of the console are covered. Id pay $350 if it came bundled with an NFC "Non specific action figure" , else 299.99 it's the most i'd be willing to pay. @Treverend I really hope what you're saying is true, because that would pretty much be the best thing in the world. Btw, I'm getting this day one, don't care what the price is.